This article will walk you through using the VirtualShield macOS Application. If you don't have it installed already, please click here to learn how to install it. Double-click this icon to launch the application. A sign-in screen will appear the first time you open VirtualShield. Note: If you can't find the icon on your Desktop, you can also launch the app by opening Finder, then navigating to 'Applications > VirtualShield'. Go ahead and enter the e-mail and password you chose when you signed up, then click the Sign In button. If you don't yet have an account, click here to sign up. Note: Your password is CaSe-sensitive. You must type it exactly the same way you typed it when creating your account. Great! You are now logged in. After signing in, you will see the VirtualShield main screen. 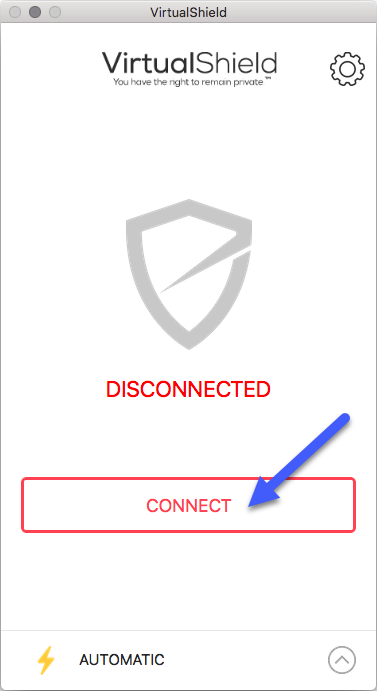 Any time you want to connect to VirtualShield you just have to open the app and log in. Tip: You can keep VirtualShield in your Dock for quick and easy access. After logging in, you will be taken to the VirtualShield main screen. Simply click Connect to automatically connect to our secure network. Note: To manually select your location, click the up arrow located near the bottom of the app. See our support article for more information. That's it! You are now connected to VirtualShield.